So about roughly a week ago, well, actually three weeks ago, we had a brief announcement about the open servers of a new recent MMO effort. Of course I gave the game a go as well, to get some impressions. Is it worth anything? Can it stand up against the likes of Legends of Equestria and Pony Town? I can’t say those really set the bar very high to begin with, but let us just see how this endeavour is gonna fare. We will quickly get the technicalities out of the way. It is 2d game based off of Unity. How people manage to grind out 2d stuff from that engine is gonna puzzle me forever (Apparently Unity has a 2d mode now). It is still in a very early sort of alpha state. This entire session of the game has essentially been nothing more than a raw engine and server stress test and large scale debugging session. 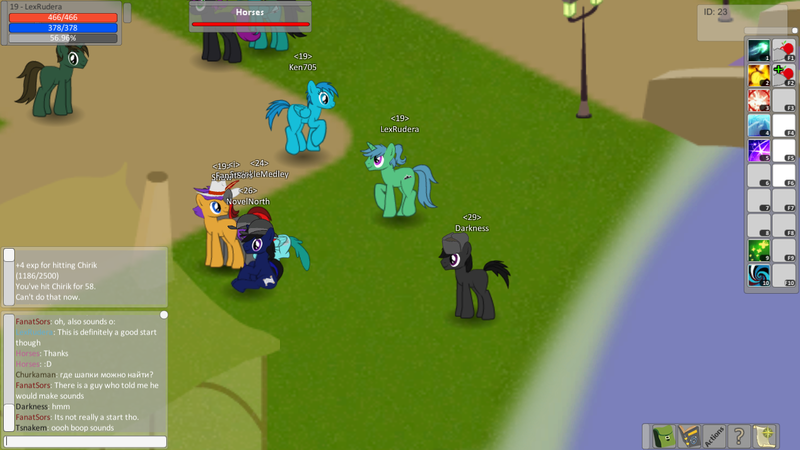 Even the name itself, Pony Room, is just a codename, to be replaced once the lead developer, FanatSors, comes up with a proper name for the game. Nor is there any sound, just small horses and small gameplay. Hence this is not gonna be a review in the usual sense, just a first impressions, get an idea of what this project has to offer in its current state. I can spoil it for you, that you can boop and hug your fellow ponies to your hearts delight in this game, so stick around and read on! 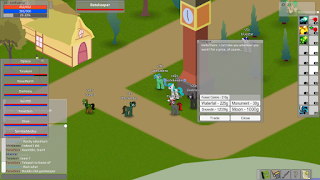 Like many others, I discovered the game through the announcement video posted on Yudhaikeledai’s Youtube channel, of Pony sims fame, which then lead to an open Discord server occupied by the developers and a crowd of fans and players. 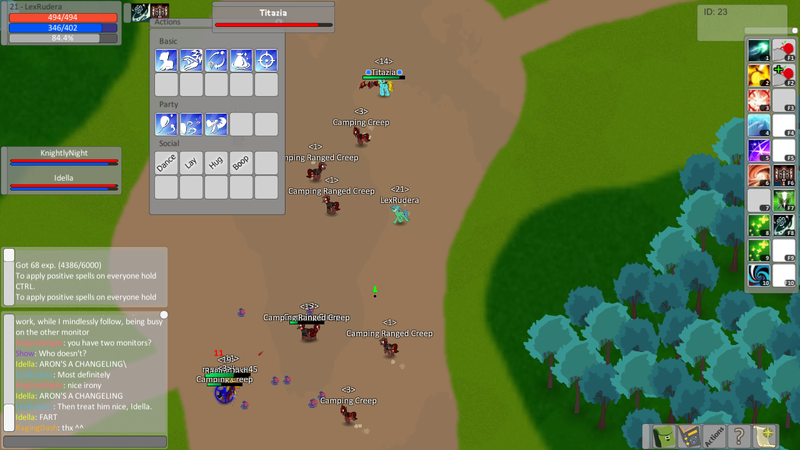 I introduced myself, got a cheeky one-on-one going with the lead developer, known as FanatSors, and finally fired up the game, with a crowd waiting for me ready to show me what this was all about. We start out in the elaborate character creator. It’s what you’d expect, aside from looking a pretty bare. Choose a race, gender colour of your pony, a cutie mark and mane and tail styles, the usual stuff you’d expect, along with... neck length? Well, I haven’t seen that anywhere else, so the game has at least that to boast with. 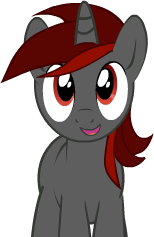 I went with the usual design I roll with whenever I get to customize my small horse, but having to choose a cutie mark from a list, I went with the first and best entirely random option. The mane can of course be much more elaborately coloured with highlight shades and that sort of stuff, my small horse just isn’t showcasing that. After a good 5 to 10 minutes of work and improvisation I found myself ready to enter the world awaiting me and experience whatever madness lied before me. Oh dear, time to get a hang of this interface amidst this chaos, so avidly welcoming me. 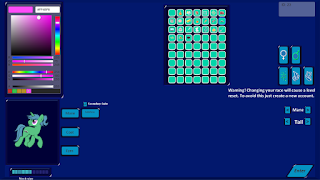 GUI elements very closely derived from the standard Unity toolkit. A welcoming text box explaining how to use the interface popped up at least. Makes for a good start of a chaotic learning experience. 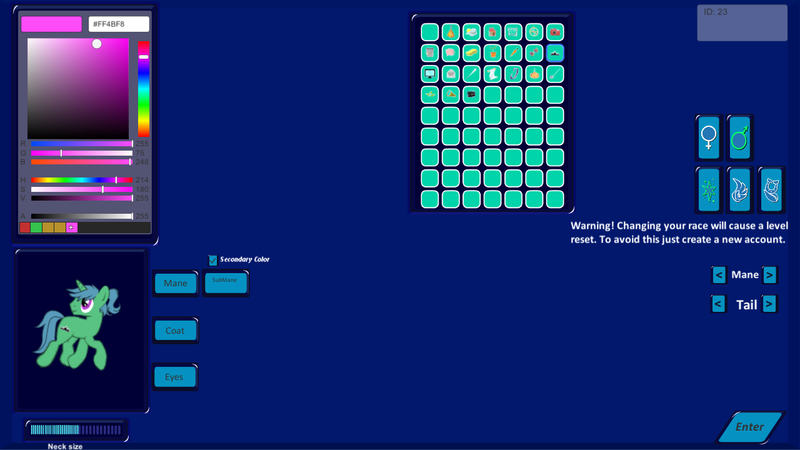 Menus bottom right, character status top left, assigned abilities on to right, chat bottom left. Alright, it is not really that unmanageable. Hotkey bars filling the entire number-key and function key rows, swap-able abilities from the action and spell menus. It is a tried and tested formular. Got a few basic spells and abilities ready and declared myself ready for the adventure! As we have gotten to the point where I, as a part of a large group, is about to ventures north out of the town and into the woods, this would be a good place to say something about the environment. Well, there generally is not much to say about it. The town is is very not-ponyville and the forest is very not-everfree forest, well, sort of. There’s stuff to slap in the forests, that is what counts. A lot of the assets, especially in the town, is reused from the works of Yudhaikeledai, but hey it’s a test and placeholders are excused. Not that they aren’t production worthy, they are used in Pony Sims videos after all. Although according to FanatSors, the entire world is gonna get overhauled at some point, when the mechanics are done. With all that said and done, it’s understandable that the terrain, while fitting, is repetitive. Occasional white lines between different colours and such. Rough, but it serves its purpose. As we are trotting merrily through the forest towards an unknown objective, we are passing by, and occasionally engaging, a number of hostile creatures, creeps, or mobs, or whatever word you fancy. Equine enemies of varying strength, in this case. Good moment to mention the surprisingly developed combat. Well, developed in comparison to so much else. Since every action is done through abilities bound to the hotkey bars, from powerful magic to booping other ponies, of course even the standard kick has to be manually assigned to a hotkey as well. Damage depends on character level and each race seems to have their own exclusive abilities. Earth ponies could do a bit of crowd control with a lasso to pull opponents in and pegasi can fly and do hit and run attacks I think. 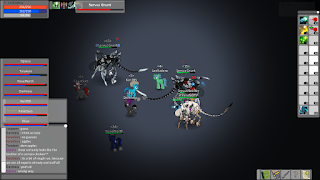 I really only played as a unicorn and had to manage my mana pool, firing elemental balls, healing and buffing other players. Along with those unique abilities all races can toss apples at foes and friends to either damage and heal. 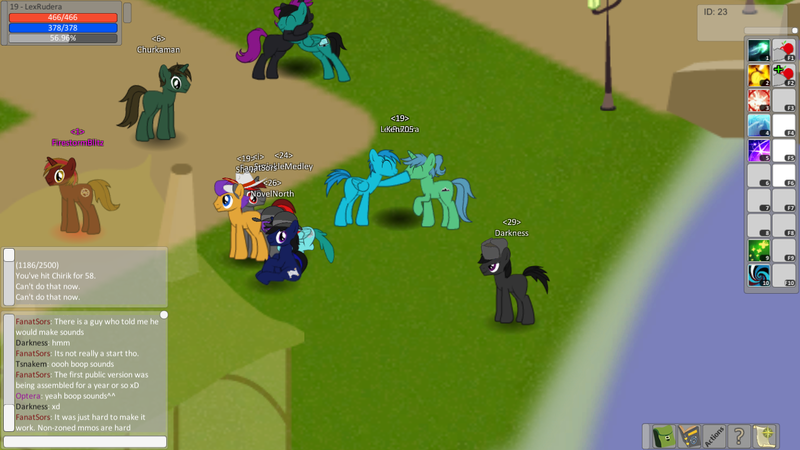 It is a nice additional touch actually, everypony being able to perform small attacking or supporting actions. You’re never gonna be completely useless, unless you didn’t bring any apples. Could help an unbalanced team still take a stand against a vastly stronger boss, but I digress. Unicorns are probably the most versatile of the bunch: While the offensive magic aren’t gonna turn a battle, being able to poison and slow enemies certainly gives an edge. Buffing and especially healing, can and will indeed turn a battle. I would even bring up an example later in the adventure where I, alone in the forest, revives my fallen comrades after a particularly painful battle with the creeps and continues mashing. It can get a bit chaotic at times, especially in larger groups. There is no distinction between targeting a player or an enemy, so nothing is stopping you from starting a right brawl amongst the ranks. Aside from not really getting anywhere with it, that is. By just sticking to laying a beat down onto the creeps, you can instead get levelling experience and neat drops to loot and keep for yourself. The loot itself are in the the form of money, more apples and earth, wind and magic ‘essence’, used to unlock skills. Earn experience, gain level, unlock skills with high enough level and essence, become unbelievable powerful, beat the crap out of your friends out of boredom. That’s the current cycle, since there is yet to be a quest system to keep you busy. After the short journey through the forest, we finally arrive at what is supposedly a cave. It looks alright on the outside, you recognize it as a cave, but you’d be forgiven to get lost in the labyrinth of monotonous grey and black depths inside. At least there are great creativity on display when it comes to the monsters. I am not sure what those things are, but they were definitely gonna bite the dust, as the group passed by, effectively annihilating them. Kicks were thrown, magic was performed, apples were tossed as I obliviously followed the murderous blob of chaos through the caverns. Crashing through the aforementioned beasts of different variations, spiders and, well, that’s about it, before encountering the boss. After an awkward sit around in front of the boss’s arena, we had regenerated our mana and replenish our health, so we could be ready to take up the challenge. The challenge of the Stingy Rock: a rock scorpion, essentially. A slow hard hitter with an area-of-effect stunning ability. It is what you would expect, but it does the trick, it takes the entire team to bring down and offered vast rewards. Not terribly inspired, but it works. Having run in circles for a few minutes, punching the walking rock, the deed was finally done. The boss was defeated and we could reap our rewards. The quest, well, quest based on our own initiative, was completed! Fortunately we each have the innate ability to teleport back to the spawn town, so we do not have to waste time backtracking back home, all the way through the maze. The adventure, however, is not over yet. The group has yet another battle to throw me in. After short rest at town, we are instructed to gather at the clock tower, where an NPC hangs out. The NPC with the power, the power to teleport you to different areas! The Gatekeeper! Chat with her and you get the option to get transported to either the Forest Centre, Waterfall, Monument, Snowdin, whatever that means, and the Moon. For a price, some more expensive than others. We were all going to the moon. I sort of forgot to check out the other destinations after this whole adventure, so you will have to use your imagination if you want to know what “Snowdin” is. To the moon we go! Well, the moon is certainly more... fertile that I had expected. Here the story repeats itself. We run through the green moon forest, beat up and loot generic equine moon enemies, not particularly stronger than those on the not-moon and finally get to the boss. Evil Luna. Not Nightmare Moon. Just Evil Luna. Yeah, I don’t know either. New Lunar Republic lore, or something, I would guess. She was probably supposed to be harder than the rock scorpion before her, but we absolutely overwhelmed her as the small army we were. Hardly a minute went by, as Luna ended up on the ground defeated, her armour strewn all over the place. We teleported back home to spawn and I thanked FanatSors for the adventure. They didn’t have anymore planned for me. It was time to go exploring and make up my own fun, see what this game has to offer the lone player. 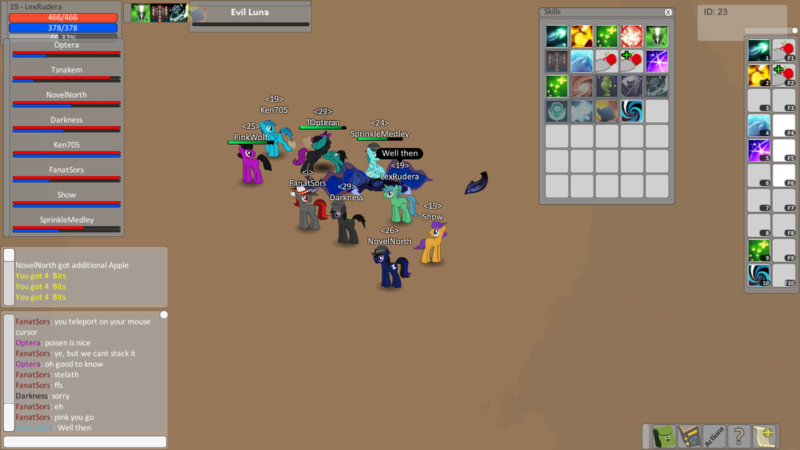 I was a free pony! Free to make of the world as I wished! Although the group did came up with a good idea for something to do right off the bat, which wasn’t specifically planned. All throughout journey we had, there has been an alert box popping up on the screen at a regular interval with the message “Enter Team vs Team Arena? Yes/No”. 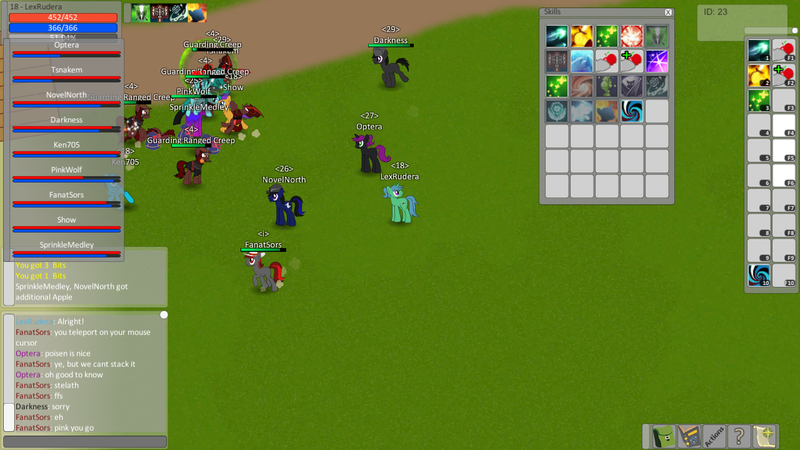 A bit of Pvp! So we collectively went on with it and had a fight. Did I do any well? I have no clue, whatsoever. Chaos would be a good word to describe it. 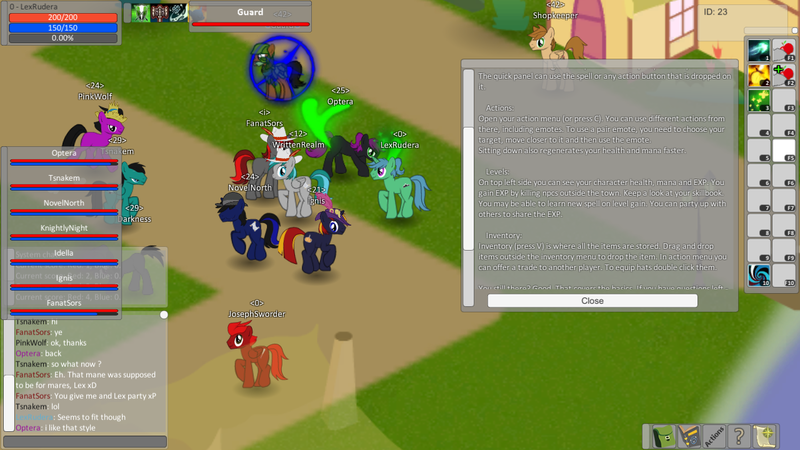 Ponies walking in and out between each other, kicking, flinging and throwing spells at each other. 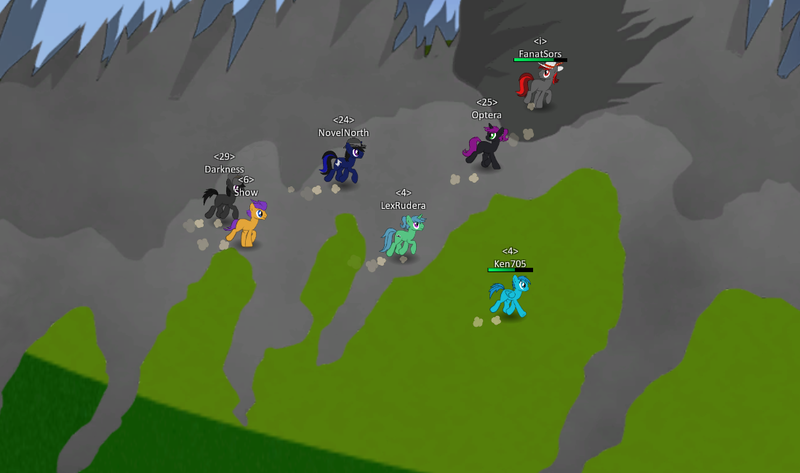 The perceived chaos might partly be my own fault though: it was only around the end of the match, that I got told to look at each pony's spot shadow to find out who was on which team. Chaos or not, it was good fun, when you were such a bunch without much planned strategy. Now that we have touched upon the Pvp, I have to say I find it delightful how it actually feels more like a natural rule in the game world, rather than an explicit “do” or “don’t”. Unlike the usual MMOs, where the worlds are often segregated into the Pvp areas and everywhere else, there seems to be no real limit here. It was not uncommon, for me at least, to accidentally throw a kick in on a friend in the aforementioned adventures and if you wanted to pick a fight, nothing was stopping you. The fight was over, my team apparently won, no idea what or why, but now it is time to kill some time. Enjoy the small gallery below, with the most interesting parts from then on. I went out exploring and found the town to be huge and full of nothing happening. It sure does look nice enough though. 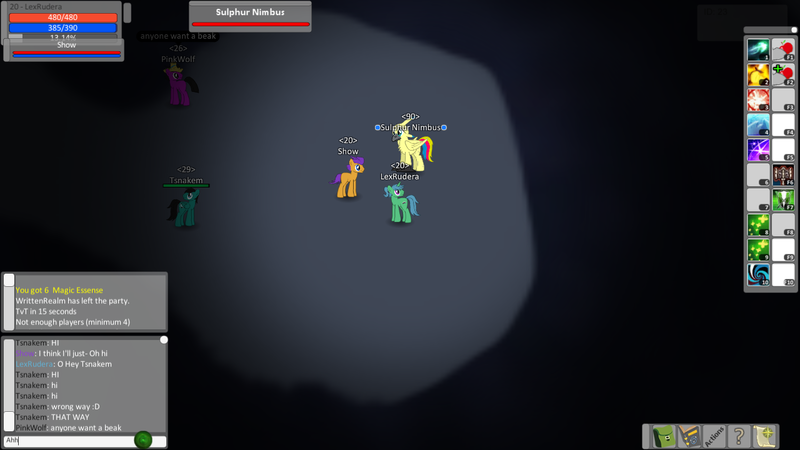 I had a little dance with my fellow ponies. Had a long hug for the fun of it. 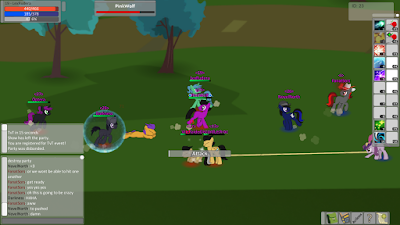 I ended ganging up with a couple of random ponies, to do a bit of fighting in the forests. It could have gone better. Got a wearable beak from it. Also boop. Have another boop for good measure. Time to get into the usual grind. From then on, the game boiled into collective grinding. More fighting low-level creeps, more talking rubbish with random players. What I have already shown, pretty much sums up the experience. On the big picture it is just like any other usual MMO, just with ponies slapped in this time around. If you love MMOs, do not mind the 2D look, and wanted actual combat out of Legends of Equestria and Pony Town, get hyped for this one. The game is still very well being actively developed, with future tests planned for December or January, which we of course are gonna announce. It is a right blast, even considering how early in its development it is. If you are any more curious, you can check out the game further at the Discord server [Link] and an occasionally updated Tumblr blog [Link], if don't want to handle the madness and rubbish talk on Discord. Although you do get the news and updates right from the horse's mouth on discord, so the place at least has that going for it. That is where I am hanging out at least.